The top five FCMs carry 51% of the Customer Seg, those FCMs are Goldman, JP Morgan, SocGen (formerly Newedge), Merrill Lynch and Morgan Stanley.Add in the next five FCMs are the top-10 carry 74% of the Customer Seg balances. Rounding out the top-10 are Credit Suisse, UBS, Citi, Barclays, RJ O’Brien. At year-end 2003, 177 FCMs submitted FOCUS/1FR reports to CFTC. Ten years later, at year-end 2013, just 102 did. By April 2015, that number had dwindled to just 75.At year-end 2003, 102 FCMs reported to CFTC that they cleared customer business (Customer Seg balances) At year-end 2013, just 69 did. By April 2015, that number had dwindled to just 57. The statistics above speak for themselves. The futures industry is going through a significant change that will have strong implications for customers. There has been fee compression and profit compression from the zero interest rate environment but regulatory costs since the crisis have also gone up. With fewer FCM's, the cost of transacting is going to increase. If you have to find a new FCM, good luck. If you want to find a new FCM at lower costs, forget about it. Concentration is high and the biggest players do not want the smaller firms which cannot generate a minimum amount of brokerage. T If a competitive market mean more choice, the futures industry is getting less competitive. It could be argued that there is still enough competition, but customers have to go to these firms to trade futures. If you want a well capitalized firm as your FCM, the number shrinks. The larger FCM's also do not automatically mean the safest. If you are small and want some service with brokerage, the number shrinks more. Small firms and weaker firms will be concentrated into fewer FCM's which means that the risk for the entire system may actually increase. Higher costs means the price of hedging goes up which can increase the risk to the system. Higher costs will reduce liquidity which creates another problem. The ammeter will have to find some equilibrium but we may not like the new world. 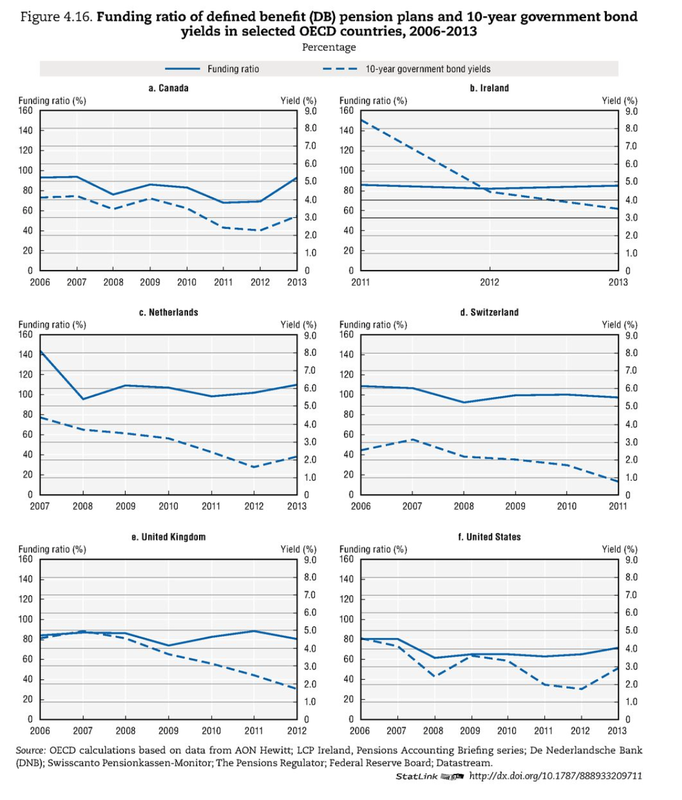 A new study from the OECD suggests that the low interest rate environment poses a threat to pension and life insurance companies. This not a threat, but a reality. There is no way that pension funds will be able to meet their obligations given their unrealistic expected returns and current interest rates. Most pensions have cut their bond exposures, but that only changes the risk profile of their portfolios. Of course, they could make this all work by massively increasing the amount of new money inflows to offset the lower returns, but that is not a solution that most would like to consider. Pensions have been adjusting to this new world but it not clear that it will be enough to help. The math works against the pensions when rates are low. If you don't think rates are going to be a problem, you can look at the funding levels to see whether the pensions will be able to meet their obligations. The numbers do not look good, but there are countries such as Netherlands and Switzerland that have been effective with meeting their potential obligations through having funding ratios that are at or above 100 percent. 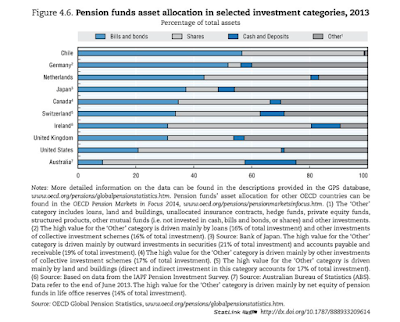 The US has some work to do to get pensions at the 100% funding level. There are no simple solutions because adding risk for higher return shift the problem. Certainly, being deep into a bull market is not the time to add more equity risk. Hedge funds are a potential solution, but they have to generate higher returns at lower risk than other major asset classes to be a true alternative. Hedge funds have to provide more return for the same level of risk than the current stock/bond allocation. It may be the only valid alternative, but it requires a careful analysis of the diversification being generated. 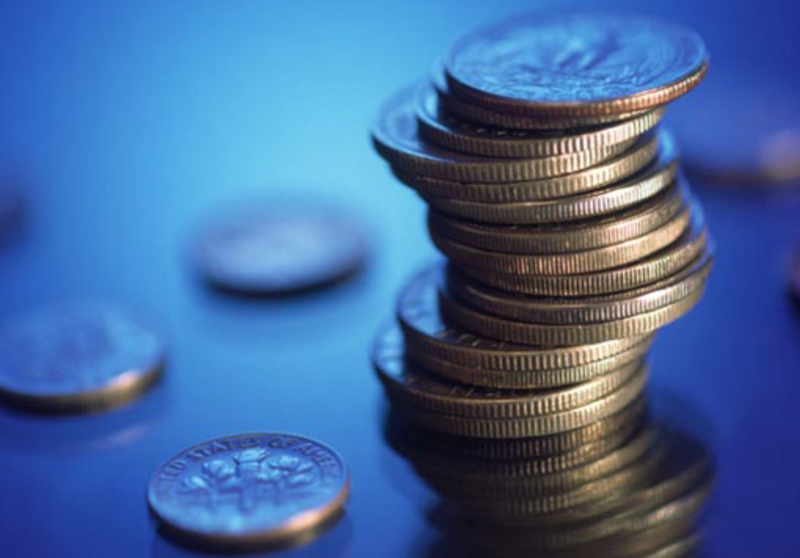 Where are the pension returns going to come from? 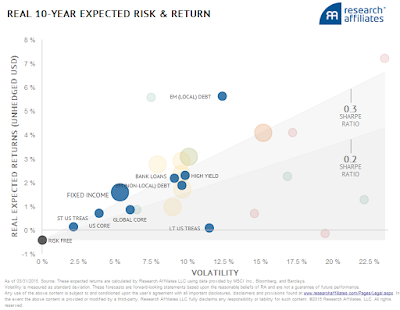 The real 10-year expected return and risks do not look attractive. The real returns over the next ten years will vary between 1-3%. This can be compared with the expected return than many pensions are using which is closer to 7.5. 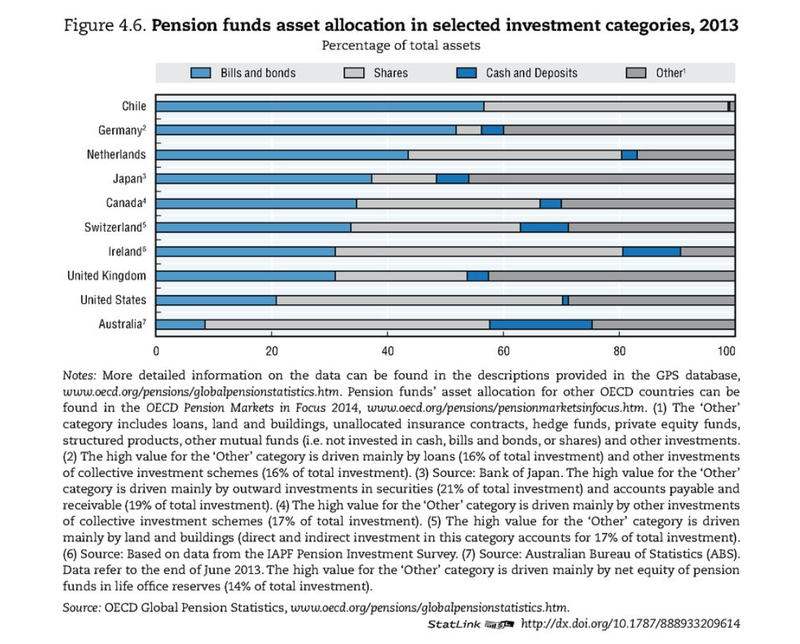 If that is the case, pension will be further under-funded and will have be required to add more cash or find some other alternative investments to make up what could be a more than 500 bp shortfall. Think of what will be required of hedge funds to make up this shortfall. The expected return for alternatives is on the high-end of portfolio returns, so just finding the average manager will not be enough. Investors are going to have to find great managers who are uncorrelated with equities. The returns are need to pull up the return of the portfolio versus bonds. Diversification is necessary to allow investors to hold higher returning equities that are significantly riskier than the total portfolio. These simple dynamics explain why a simple "LED" portfolio of liquidity, equity-based, and diversifying assets can go a long way for showing what is needed to help meet investor needs. 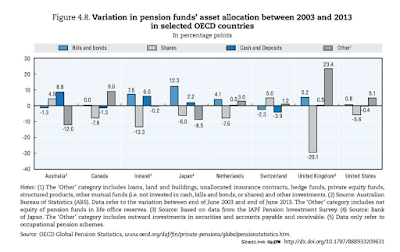 Pension need to hold cash for immediate fund requirements, equity-like instruments for return, and diversifiers to ensure the portfolio does not have get too underfunded in "bad times". The hunt is on for finding those special asset that truly add portfolio value. What are you going to do with all of those bonds? The expected real returns for bonds do not look very attractive for the next 10-years. Long-term bonds are expected to have a real return of zero with double digit volatility. This is just one expectation, but the numbers are not at all odd when you walk through some scenarios. If the current 10-year nominal yield is 3% and we have 1.5% inflation over the next year, the real yield will be 1.5%. If we have any increase in rates, that yield will be chewed up quickly. A 10-year Treasury with a duration of a little less than 9 years will have a negative return for a rise of 35 bps. The question is why are investors holding any bonds. 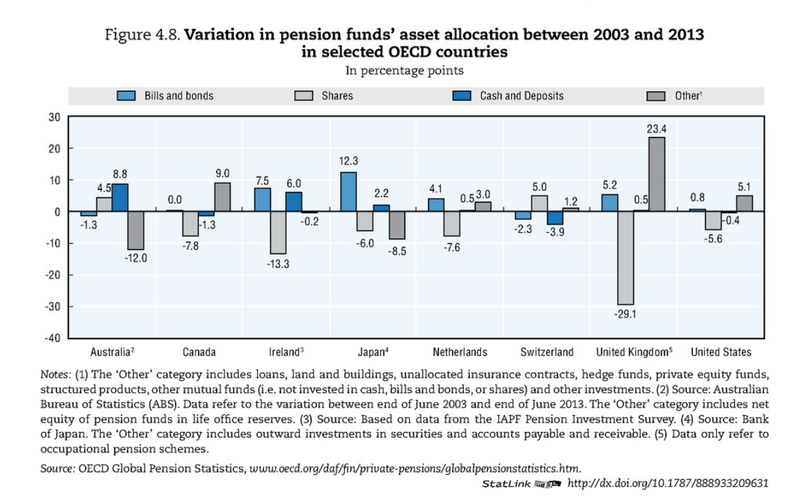 If a pension fund has an expected return for actuarial assumptions of 7.5%, it will have to be a very good investment manager to get a real return better than in the chart or it will be in for a significant surprise. So what are you going to do with all of those bonds? The pension still needs yield for cash flows. One could say that the hedge fund explosion has been about finding bond substitutes and not about beat the stock market. Hedge funds are supposed to provide the diversification and yield or steady return. Every hedge fund has to be bench-marked against its ability to provide stable return and its degree of diversification. If you cannot do one, you better provide the other. Sovereign wealth funds have been very holistic in their approach to strategic asset allocation. These funds think about the true risks for their clients (citizens) which is associated with the consumption and revenue pattern of their country. They truly have to think about portfolios that can weather 'bad times" or market downturns because they are investing their country's wealth. They have to account for demographics and the depletion of resources. There are a few states that have the same mandate as a sovereign wealth fund given revenues from natural resource extraction like Alaska, New Mexico, Texas, North Dakota, and Louisiana. These funds have to think about resource prices, cash flows, and how to make the money last over the long-term long even after the resources have been used. State pension funds should also be aware of the revenue and consumption patterns in their states and tie their expected returns to growth and demographics within the state. Their resource is human capital and investment patterns should reflect the type of growth and human capital within their boundaries. Consequently, the state pension has to think about diversification of "bad times" within their state no different than the individual who has to think about diversification against their own bad times and risks. Their portfolio should reflect not just the overall business cycle but the unique or local cycle issues within the state. Hiring and raises will be tied to state growth which will then feedback to pension obligations. States working through long-term slowdowns or regional cycles have to change their investment pattern to reflect these changes. If slower growth is systematic and not just cyclical, the portfolio should reflect the issues. The expected return of the portfolio has to reflect the unique cash flow patterns of the state. The agricultural-based state does not need commodity exposure especially from the long-side and the state that is focused on financial services does not need more bank exposure. Hitting the expected return target may be too simplistic in its approach to forming the right portfolio. This is a reflection of consumption based asset pricing models that are tailored to a state. Why this is especially important now is that many states are thinking more deeply about their exposure to hedge funds as diversifiers. Perhaps an even deeper analysis is necessary to determine what exactly has to be hedged. I think this is a simple innovative way of thinking about portfolio structure. I am not completely sold on the operational construct, but it may be a good simple way to think about core principles needed for any portfolio. You need liquidity. You need returns. and you need diversifiers to generate the only free in finance. The diversifiers allow you to hold risky assets that will turn down when the economy turns down. Simply put, do you have liquidity for cash needs? How much of your portfolio is locked up? Do you have the right amount of equity-like returns to hit a performance target? And, do you have diversifiers for protection? The real free lunch comes when you have assets that have all three characteristics, liquidity, diversification, and and high returns. 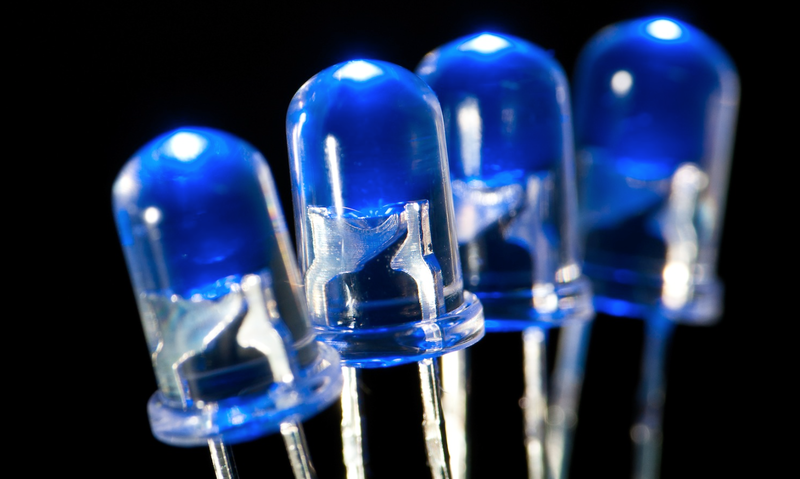 LED is a good way to look at a portfolio structure from a different perspective. 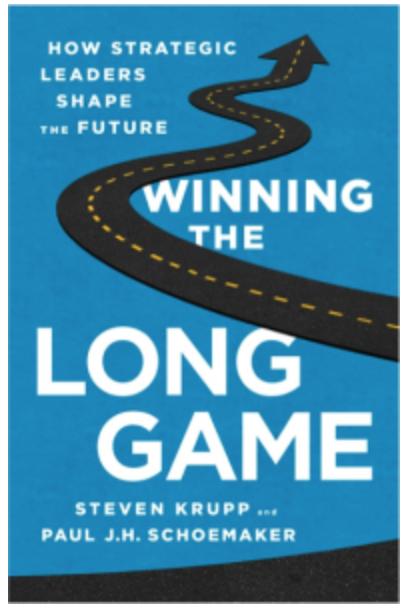 The new book Winning the Long Game: How Strategic Leaders Shape the Future provides six elements of what makes a good strategic leader. It was written by one of the leaders in decision theory, Paul Shoemaker who I have followed for years. 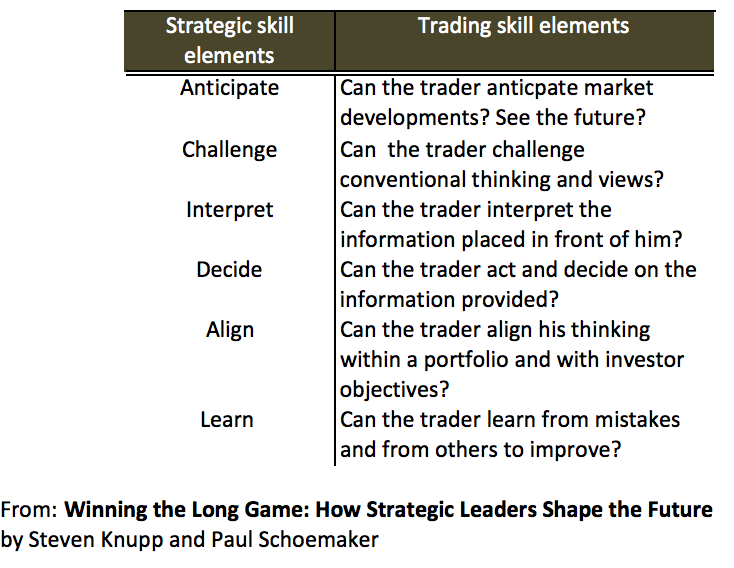 When I read the elements of strategic leadership, it felt as though I was also reading about the key skills of what would be a good trader. The authors focus on six key skills which make an effective strategic leader. The actually provide a test of whether you have these six elements. I think a similar test could be developed for traders. 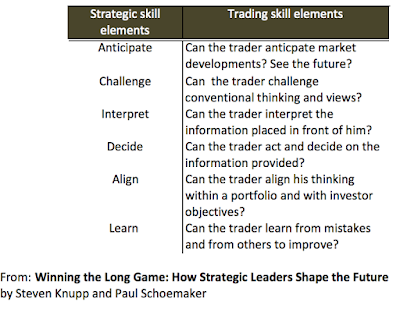 If you can determine whether a trader has these skills you have gone a long way at conducting an effective due diligence. I have taken each of the six elements and matched them to the type of questions you would ask a trader to understand how he thinks. Of course, the questions could be more detailed but the six elements seem to hit all of the key spots. The good trader has to anticipate change. Thinking through change can come in a number of forms, but asset markets are expectation markets which mean you have to think about the future value not the past performance. The good trader challenges his thinking and will not accept what would be called conventional thinking. If everyone is thinking the same, someone is not thinking. The effective trader is good at interpreting the information that is placed in front of him. He can turn facts into information that can be used to enhance knowledge. Nevertheless, analysis is not enough. A good trader has to decide and have a process on how to act. The trader also needs to align his interests with those of the client through his portfolio structure. Finally, there has to be some form of learning or feedback which will allow for new thinking. Anyone who can get these six elements right will be a good trader or have a fighting chance for successful asset management. Everyone does not have do this the same way; however, discipline and structure through using these elements provide for better decision-making. Data or theory - what should an investor emphasize? The empiricist thinks he only believes what he sees, but he is much better at believing than at seeing. Never theorize before you have data. Invariably you end up twisting facts to set theories, instead of theories to suit facts. It is important to be focused on the numbers but it more important to have a theory or mental map of what you expect and how you see the world. Data is never enough even if you are a priced-based manager. You have to have an understanding of what causes prices to move and why prices do not adjust immediately. The need for a theory is critical for any empirical work. Could N. M. Rothschild be a systematic trader? "Buy when there's blood in the streets, even if the blood is your own"
Would a systematic trader even invest this way? There are investment adages that many will nod with approval once they are presented, but it may be difficult to actually try and project the rules that would be employed to make this wisdom operational. If the great Nathan Mayer. 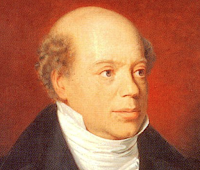 Rothschild, was a systematic trader, how would he make his wisdom operational? The basic premise is that if there are loses or blood in the street, an investor, even if he is one of the investors bloodied, should be doubling down and investing more on the decline. No trend-following for Rothschild. No stop losses. 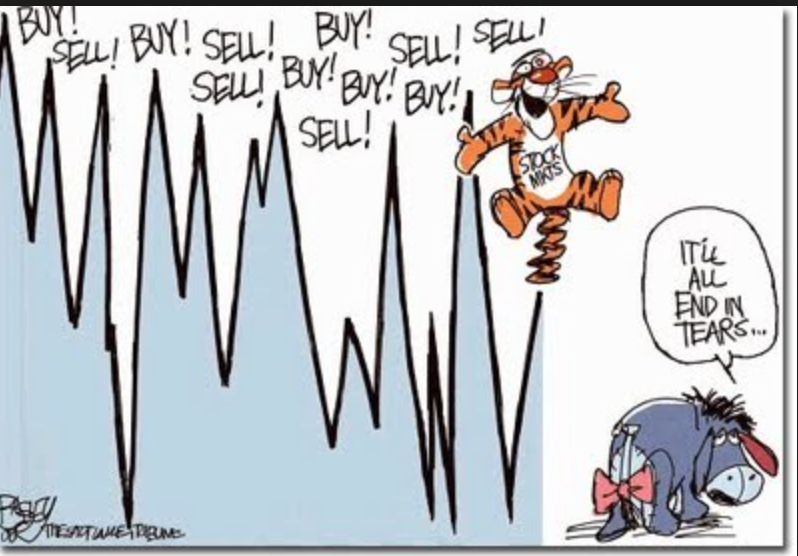 Add to the position when there is a major sell-off. The Rothschild quote would likely never come from a traditional CTA, but that is the point of our focus. Rothschild would be a value investor who could, would, and should invest on weakness. It is different strategy than the trader who will buy on trend and cut loses with a stop. The problem is that value investing is harder to turn into a set of operational rules. If you are long and prices fall, the market could be telling you that you are wrong. You have to validate your expected price quickly. 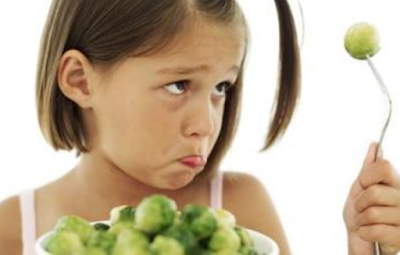 Buying on weakness could be the worst thing to do. In a crazy blood in the street scenario, the first thing may not be to buy but question all your assumptions, erases and move to the sidelines even if it is temporary. Beta, enhanced, and strategy - what works in the commodity world? The choices for investors in the commodity field is getting crowded as the market has moved beyond simple long-only passive indices. A quick search of Bloomberg shows beta, enhanced, and strategy index categories that are all employed in the commodity space. You can track 69 different indices including 24 beta, 16 enhanced, and 29 strategies. The beta indices are long-only combinations of commodity futures that mainly vary by market weight and contract maturities. These allow for differences in market exposures and roll yields. The beta portfolios range from the well-established indices such as the GSCI and Bloomberg to indices that are focused on alternative weightings or holding longer maturity contracts. These are beta indices in the sense that they should move up and down with the overall commodity market. There could be a strong argument that there is no clear definition of beta in commodities, but we will let that pass. The enhanced indices try and take into some specific commodity patterns within futures markets such as backwardation and contango. The focus in backwardation or spreads create lower volatility portfolios that attempt to have returns less correlated with the overall direction of the market. The table above shows the high and low return for each index category by year as well as the range. We have color-coded the high and low returns each year with the best category being green, the worst red and the middle blue. This will help show what will be the max gain or loss across all index categories. There clearly is a large range within any strategy. The gap between picking the best and worst index in a given year can be upwards of 20 percent for the beta portfolio. It is actually wider for the strategy indices which try and exploit repeatable events. The enhanced indices show the tightest range but even in this category there is double digit differences. The commodity space is clearly uncertain with no order in performance. Strategies will do the best in any year and they will also be the worst within the space. Surprisingly, the beta portfolios are not a bad choice in the confusing world. Their low-end generally will not be the worst performer when compared with the other strategy. Gaining commodity exposure is not easy investment decision. 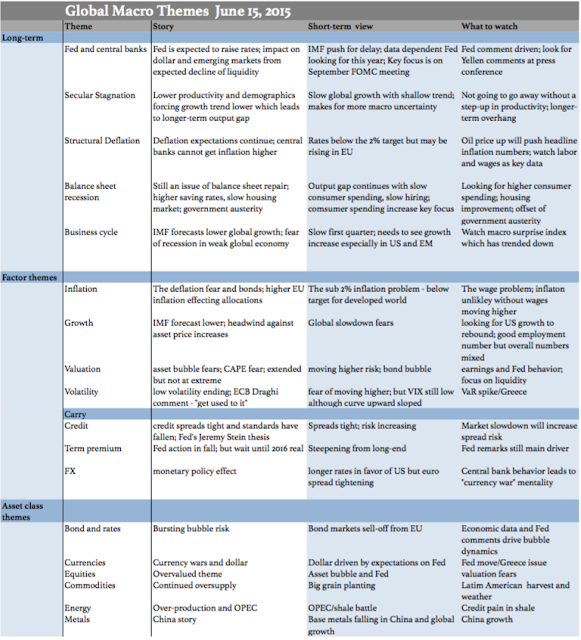 We have always been asked to present what we think are the key global macro issues on one page. In a busy world, can everything be condensed into something that is quick and easy to remember? We try and make that happen. Our one page is broken into three parts, long-term views, factors themes, and asset class themes. The long-term views will not change often but hang over the markets and filter the thinking of global macro managers. The factors themes describe the big issues through what would be the key actors that affect returns. The asset class theme will be the classic performance drivers for any diversified portfolio. There can be significant analysis on any one of these issue, but our focus is on the theme, the story behind the theme, the short-term view, and what should be watched. This is a work in progress and will be updated regularly. The purpose is to focus discussion. You may not agree with the themes or the story, but if it causes you to think, it has done its job. Crowded trades - what to do? Markets are nearly efficient in using all information and reflecting equilibrium prices, but not completely. The lack of completeness exists because all of the capital needed to make the market efficient may not be immediately available. Flows in reaction to news matter and occur over time. The speed of capital and trade flow will have an impact on behavior of price, and this adjustment to equilibrium prices will often take time. These adjustments in prices are usually not immediate and are the cause of trends. In simple terms, as flows increase, market prices will rise if there is not the same amount of dollars on the opposite side of the trade. If there is too much or too little flow, there can be a liquidity problem of either under or overreaction in price. At the extreme, too much flow and positioning leads to crowded trades especially if here is not offsetting views to provide liquidity. The crowded trade may be too much flow or positioning too large in a given idea, strategy, or market. This is one of the risk problems that have often not been given enough attention. A single hedge fund strategy may be small relative to the total market volume of trading or the open interest in a futures market, but if many funds are doing the same thing, there can be a shortage of liquidity. The aggregate risk can feed back and effect the actions of the individual. Crowded trades are a problem especially with global macro managers because there are fewer macro opportunities. For example, if one believes in a deflation story, there are a limited number of trades that can be structured. If everyone thinks the yen is going lower, the amount of capital on one side of the market from one type of trader can be quite large. If the traders are all of the same type and watch the same news and data, there is a greater likelihood that they will move together. This movement together can cause market cascades of one-sided trading. For macro traders, the hope is that the total size of the market is much greater than the marginal behavior of himself and similar traders. A stock investor who has a broader set of names to trade can avoid crowded trades because there are just a wider set of opportunities. Of course, each market may be smaller so crowded trades can still exist, but the chance for diversification is greater. The issue is always the balance between the size of the speculative traders who may be acting on an expected information advantage and the objectives of other traders. Crowded trades are dangerous because of the potential for what we will call negative cascades. Demand may build over time as money flows into a trade only to see it quickly reverse. The potential for quick reversals based on some catalyst event. Focus on finding the market tilt from a crowded trade. Using the commitment of traders as a crowded trade tool. If the commitment of traders is at an extreme, there is a crowded trade. Matching analyst views with crowded trades. If all of Wall Street is talking about specific trades, these trades will be crowded. Extended trend trades become crowded and will likely reverse. Low volatility trades will become crowded and be subject to reversal if there is a volatility increase. Low interest rates and high liquidity will create potential for crowded trades through leverage. A change in leverage will reduce the crowd for any set of levered trades. More will come and lead to fats reversal, so managers should be prepared for crowded trade risk. We have talked about being in the investment twilight zone where we are between the old regime of QE and the new regime of rate normalization. The Fed either does not know when to make the jump to the new regime or does not have the data to cause them to jump but the old regime is over. This creates market uncertainty that is a different form risk. The uncertainty is that we do not know the model of the markets that can fit the facts or behavior. We have been given Yellen dashboards and Taylor Rules, but the link between data, model, and action is not clear. Our benchmark models of behavior could be flawed. The flaws in models can be on two levels. One, the models used by the Fed itself could be wrong. Given their forecasting history, this is a real problem. Two, our view of what the Fed is doing could be flawed. 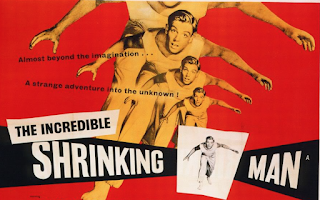 We are using the wrong model to explain the Fed. There is uncertainty over what is the true model managing monetary policy. This requires deeper thinking about policy behavior. The use of robust control can provide some important insights on the how investors may behave to this problem. It is nicely described by Rhys Bidder of the San Francisco Fed in "Animal Spirits and Business Cycles". The robust control work suggests that when there is a model problem that creates uncertainty the best approach is to develop a worst case scenario against a benchmark. Take a benchmark model, shock its parameters, and assume the worst. This is form of min-max thinking when the model used could be wrong. There has to be a trade-off of pain and plausibility. Start with something plausible and then see what happen to your pain if the model is not true. The robust control model gives a framework on what to do, but this has strong macro implications. Your worst case scenario will be tied to the amount of volatility or uncertainty faced. If volatility increases, the worst case scenario approach will mean that your negative view will get worse. 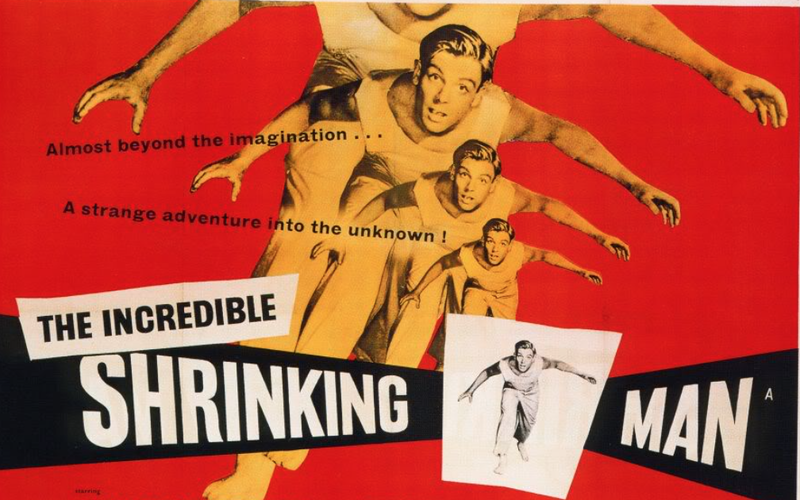 More uncertainty leads to more thinking of possibilities away from the benchmark. In the macro trading world, the markets will be more sensitive to volatility changes and disagreements about the benchmark. Call it animal spirits, but traders will be a knife's edge on Fed thinking changes even if they don't know the true model. Since we are in the twilight zone between policies, we are facing the maximum uncertainty and a pessimism based on worst cases. The Fama-French model is the standard which many use for looking at return decomposition of a stock portfolio. 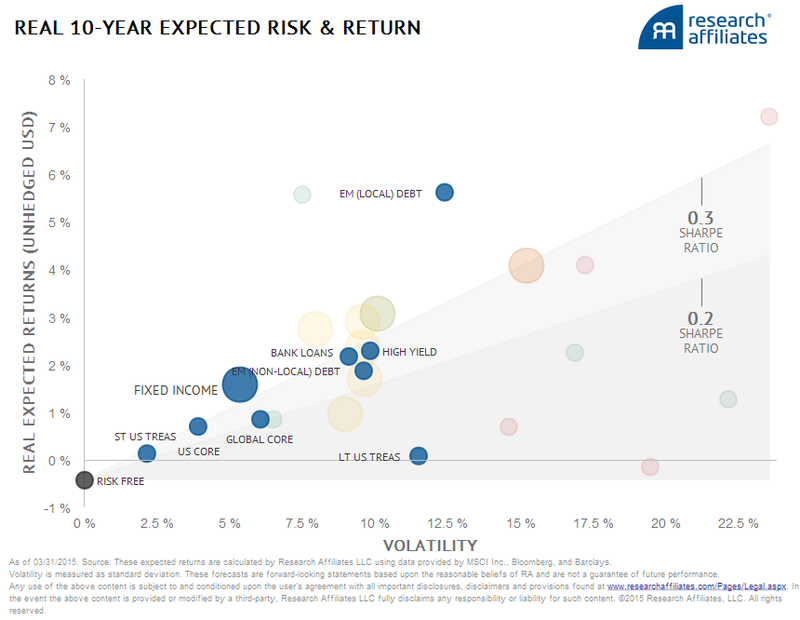 Returns are broken down by market risk, a small versus large market cap effect, and value effect based on book to market. However, there is now the five factor Fama-French model. Added to the model have been profitability and investment. 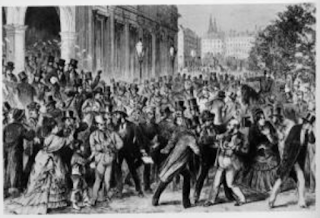 Additionally, there is a momentum effect which many agree exists but which was excluded by Fama-French. This five factor model is going to be the core of any money manager in equity. There is no question that it should be be the benchmark standard for looking at alpha generation and risk for any money manger. The latest research by Nusret Cakici of Fordham University suggests that the five factor model has different weights in different regions with some factors not being significant. The five factor model does a good job of explaining return behavior in North America, Europe, and global portfolios, but does not seem to work well in Asian markets including Japan. While value is redundant in the main markets of North America, Europe, and global portfolios, it is not in Asian markets. The Asian markets are different and offer unique return profiles. make sure you look at Asia and its differences. This work is consistent with earlier work by Cakici which shows that emerging markets are different than developed markets using a three factor model with momentum. There is room for holding and trying to exploit a mixed equity portfolio for a macro manager. The change in focus by money managers from asset to factor-based investment management is the future of finance. Thinking through how any factor effects asset is still the number one issue for all asset managers. The driver of returns is fundamental to understanding return behavior. These are simple questions that still need good answers. If there is an increase in economic growth, how will it effect a given stock? If there is higher inflation, how will that impact the bond markets? What is the relationship between the business cycle and any asset market? What is the impact of oil price shocks on energy companies? You cannot be a good money manager without having a view on these issues, so focusing on the factors seems natural. The same applies to investors. It is not what assets you hold but what factors you want to protect against. Is it inflation? A downturn on the economy? Regional growth? Understanding these is vital to meeting long-term portfolio needs. Unfortunately, the link between factors and assets is not well-defined, changes over time, and can have a slow adjustment. We work with assets because prices are primal and drive returns. I don't know for sure the reason for an increase in price but I do know that if I am long and the price goes up my returns are positive. If I don't hold an asset that goes up faster than other assets I hold for the same risk, I have made a bad decision. 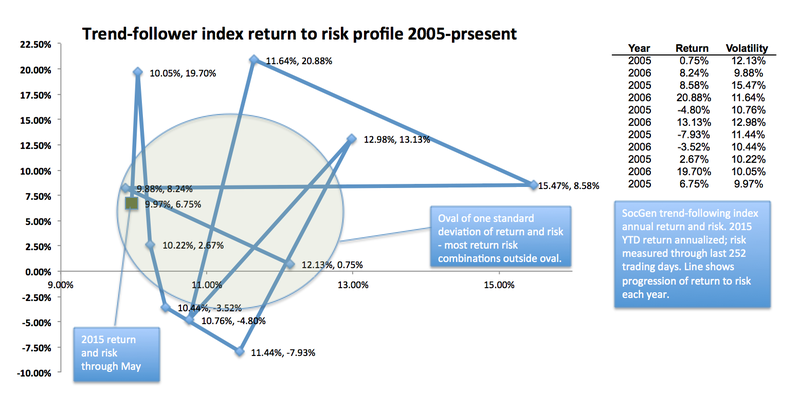 Factors serve as the core for performance attribution to portfolio returns. If you can make the right attribution forecasts, you will outperform other managers, but you have to understand the links between factors and assets. Knowing that they exist and the general attributes is not enough. The future for managed futures and systematic trading is to embrace the factor revolution and use the behavior and link between factors and prices as an added tool for the improving performance. Success of the next five years will be for any manager who can make an effective leap to factor-based management. Bonds and bubbles - are we seeing the reversal? The market talk in a number of circles has been that we are in a bond bubble, so the current sell-off is the pricking of that bubble. It is always hard to tell whether you are in a bubble. There is mp set definition. This is one of the main reasons central banks have avoided dealing with them. However, some have said there are set conditions necessary for a bubble and it can be argued that we have seem most of them in global bond markets. 1. There is a new paradigm and convincing fundamentals or at least it is hard to compare the current environment to the past. For the global bond markets in the developed world, we have had all four conditions. The new paradigm or conditions for holding bonds is secular stagnation and deflation. There is convincing evidence for both stagnation and deflation which makes for a compelling story for holding bonds. This new paradigm is hard to compare to the past, so the stories of today seem right for investors. There is plenty of surplus liquidity even if it is not coming from the Fed. Other central banks are providing the liquidity to allow a bond bubble to continue. There is a demand/supply imbalance based on the excess savings of consumers and the austerity of governments. There has been a shortage of high quality safe assets for investors. The strong performance forces asset managers to buy assets that have been going up in value. There is a classic momentum effect in the bond market until this quarter. The Fed talk of raising rates could impact liquidity although the Fed has not talked deeply about how it is going to reduce its balance sheet. More consumer spending, greater bond issuance, and less stretching for yield will reduce the supply/demand imbalance. The recent decline in bond performance will be causing asset managers to rethink their current asset allocations. The bond bubble may continue with this quarter being just a temporary adjustment, but more likely we are seeing a big bond unwind with investors starting to balk at yields that do not compensate for their risk. With the SPX index up just over 1.6% year to date, it may be good to see what alternative investments have done as we move into the last month of the second quarter. Looking at the HFR hedge fund indices, we find that hedge funds have been able to best the stock market returns at lower volatility. Of course, these indices are not investable, but the numbers provide some insight on relative performance. Volatility, fundamental growth, multi-strat, and special situations all beat the broad market by a factor of three. The poorer performing global macro and systematic strategies also beat the stock market with lower correlation. 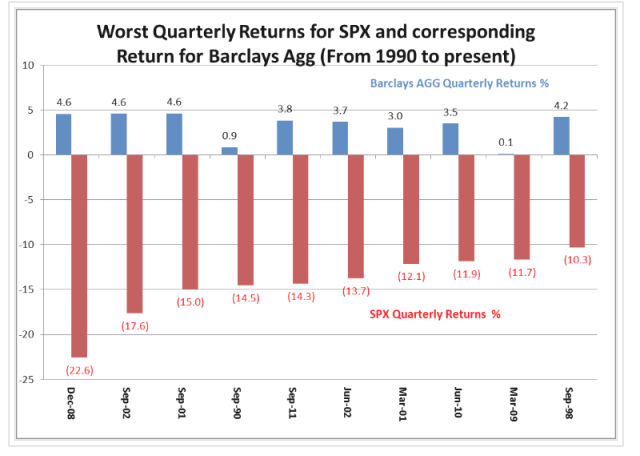 Interestingly, the best performers like systematic macro in the first quarter have moved lower in the last two months. The bond market and gyration in the currencies have both led to lower returns for macro managers. We also compared returns versus three year volatility numbers. The trend line shows the return to risk trade-off plus and minus one standard deviation away from the regression. Systematic managers had more risk and lower returns YTD. Overall, global macro was lower than average as marked by the green triangle.The confusion in macro markets have hurt these managers over the last two months. The normal or traditional view for asset allocation between stocks and bonds is that there is a negative correlation between the two asset classes. Bonds provide a safe hedge against a stock market decline. Unfortunately, the correlation between these two asset classes is not as stable as many think. It can move from deeply negative to positive. The bond hedge does not always work. In fact, holding bonds this quarter has been the risky strategy. More importantly, there is not symmetry between extreme moves in stocks and bonds and extreme moves in bonds and stocks. Look at two extreme. In the first case, we look at the biggest down quarters for bonds. 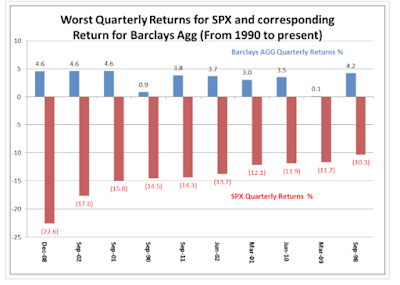 There is no pattern with stock returns during those periods. With bonds down, stocks could be up or down. In the second case, down stock markets will usually see bond gains. Bonds serve as a hedge during down stock markets, but stocks do not serve as a hedge for down bond markets. A down bond market is a dangerous situation for any asset allocation. Investors seem to prefer the discretionary trader or forecaster over the systematic model or algorithm. There is always reason to be skeptical of models and a requirement for strong due diligence of a investment process. It applies to any manager or investment process, but may be even more applicable for complex strategies that may not lend itself to simple story-telling. There are clear issues with data-snooping which require attention, but the avoidance to algorithms seems to run deeper than just healthy due diligence. I could not always put my finger on the skepticism. Perhaps it was my own failing at being able to articulate what a model does or perhaps it was a problem with the investor who did not have strong quantitative skills. Now there at least seems to be some better identification of the problem. In a recently published paper by three Penn professors, we have a new term for why investors may avoid systematic strategies, algorithm aversion. In their paper, "Algorithm Aversion: People erroneously avoid algorithms after they err", the authors provide evidence concerning how individuals choose between human forecasters and statistical algorithms. There is a strong bias against the models. 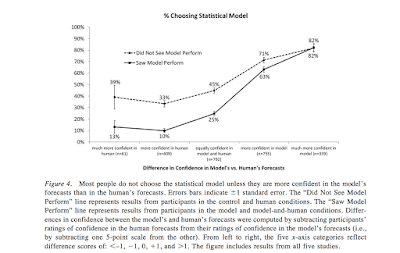 This bias exists especially after individuals see the models perform. They are less forgiving of any errors made by the model even when the models in general do better. They will quickly lose confidence in a model after it makes a mistake or after they see it work. They are more willing to accept or keep their confidence in the human forecaster. After they see an algorithm perform, they will go with the poorer forecasting human. The authors do not provide strong reasons for this aversion, but the test subjects are unforgiving with model performance versus humans. 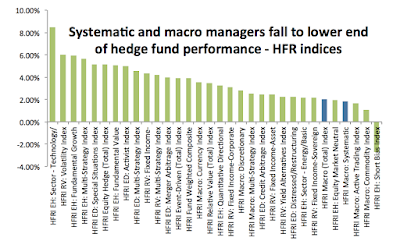 Think about the avoidance of systematic managers in hedge fund land. By the conclusions form this research, investors will be more forgiving for a poorer performing discretionary manager. First chance an investor sees an error, he will redeem even if the long-term performance beats the human manager. If he see the algorithm perform, that is, he sees the track record, he will avoid. I am not saying this happen in all cases, but this research suggests that the bar is set higher for systematic managers than discretionary managers and it may hurt the long-term performance of an investor's portfolio. Investors should be aware of this bias before they make a portfolio decision. Data! Data! Data! I can't make bricks without clay. Systematic trading has significant value, but there are two problems that have to be thoughtfully addressed, data availability and back-testing. All fit within foundational issue of data-mining. Our first quote from Sherlock focuses on the key requirement of any systematic trader, you need lots of data. In fact, there may never be enough. If you pass through using a few years of data for analysis and model identification, you still need a data set for forward out-of-sample analysis. The data problems become even bigger when you employ fundamental information. There are small sample size problems, data revisions, data delays, and model uncertainty given changing relationships. The focus on price data is caused by the need to have more "bricks". There is also the problem that you cannot run through multiple models over the same data set without data snooping. Searching for the best model all causes in the degrees of freedom available for he researcher. Empirical analysis without theory is torture of data without know the crime. Finally, if the world changes, old data has to be thrown out or at least be discounted, yet cutting sample is the equivalent of losing your memory. The systematic manager has advantages of the discretionary trader through the use of disciplined decision-making, but training to be disciplined with wrong conclusions for a special case plucked from the data can be more dangerous. 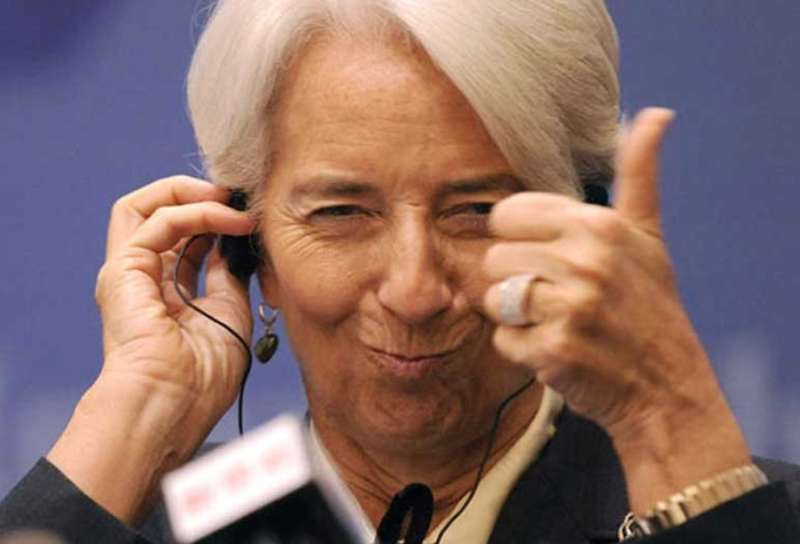 IMF head Christine Lagarde made the unusual public statement that the Fed should delay any increase in interest rates until 2016. Her comment was based on the low US inflation rate and the uncertainty about the resilience of US economic growth. This is just after Fed Chairman Yellen suggested last week that a Fed increase was likely this year. The IMF also lowered its forecast for the US to 2.5 percent from 3.1 percent. It has also lowered its global growth forecast. The IMF is worried and thinks the Fed should be too. This places the Fed in a tight position. 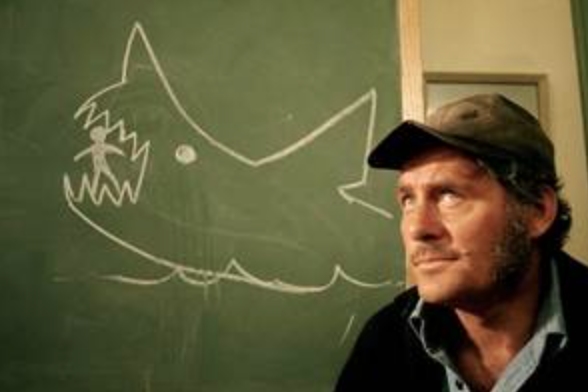 If it raises rates and there is a problem, it looks like it did not heed this learned advice. If there is a contagion to the rest of the world from a U.S. rate rise, it will look like the Fed is responsible for the economic problems in the rest of the world. What the IMF is saying is that the rest of the world needs dollars and needs the U.S. as the driver for economic growth. The IMF view is that the Fed is being too cavalier about normalizing rates and that six years after a the financial crisis caution is needed with raising rates even 25 bps. It is question of how sensitive the global economic is to such a change. Chairman Yellen, you are on notice. You need to slow down with making any hasty decisions. 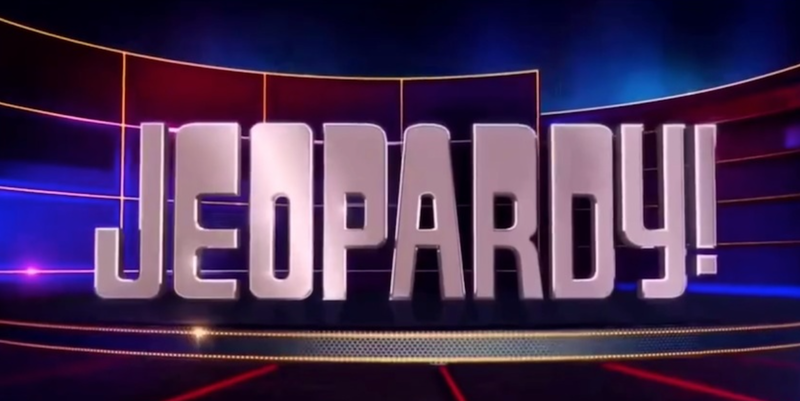 ECB Draghi's Jeopardy answer - "get used to it"
Everyone knows the routine for playing the game Jeopardy. 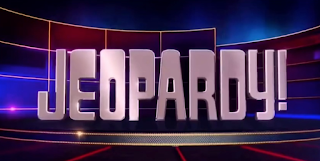 You pick a category and the host reads an answer and you have to provide the question. We can play the game with the category "financial markets". ECB president Draghi's - "get used to it"is the answer. Our response as a question will be "What is higher volatility and lower liquidity in European bond markets?" 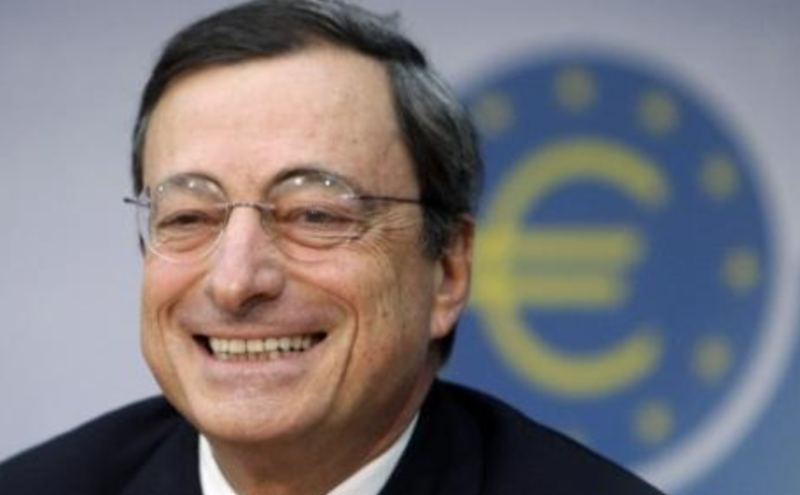 There is over 60 billion in euros spent every month as part of the ECB's QE program and yet the market reaction is more uncertainty with a lack of liquidity. It is hard to say that bonds are the safe asset of Europe and the spill-over is hitting all global bond markets. This volatility and lower liquidity is changing the complexion of bond markets. Traders are coming back to what used to be a sleepy area for many in the post-crisis period because directions are less clear. Uncertainty leads to opportunities. The term spread has been used as a good tool for predicting recessions. When short rates are above long-term rates, there is a greater chance for a recession in the coming quarters. 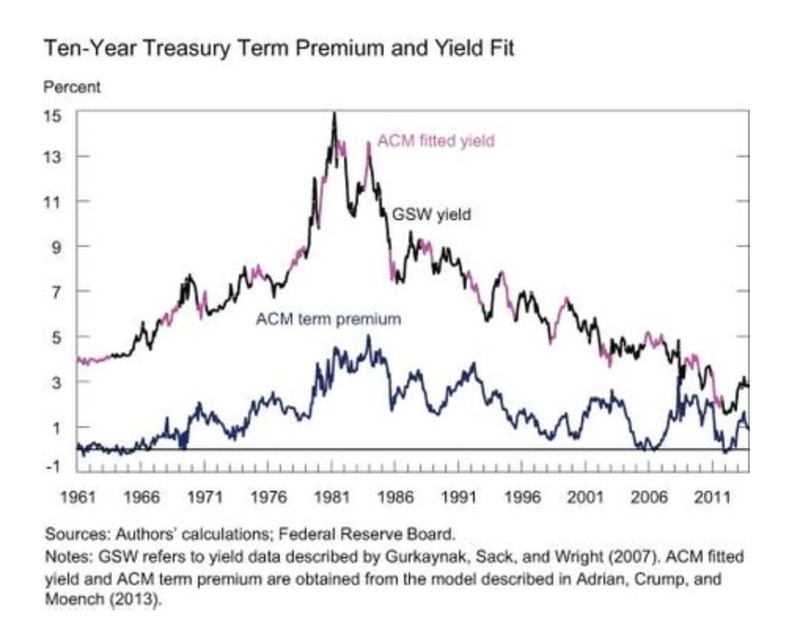 We also know that the term premium or the difference between long rates and the average of future short rates will have to be related to yield or term spreads. These are all related to economic factors. 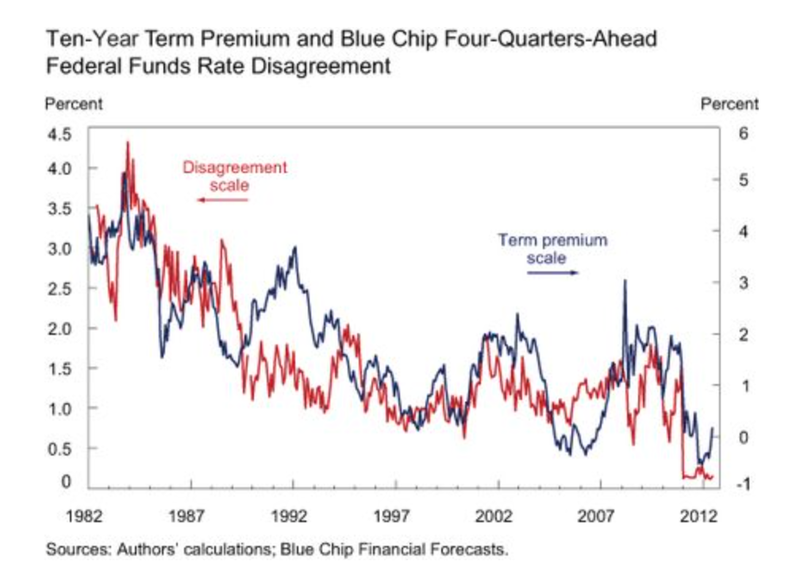 The term spread = expectations between short + long rates and a term premium. The expectations will related to the components of nominal interest rates, expected inflation and expected real rates. 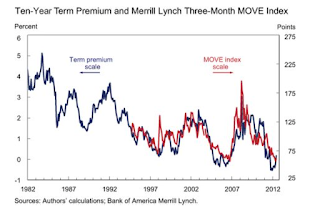 The term premium will have to be related to the risk premium in inflation and real rates. 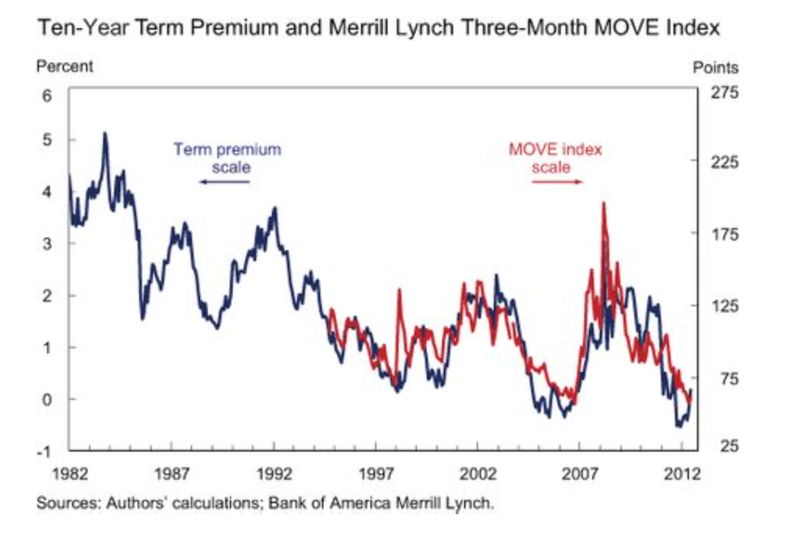 More generally, the term premium is related to macro factors of risk with inflation and real rates. There can also be a risk premium with the bonds themselves, supply and demand characteristics but those may be harder to measure. Researchers have found that term premiums will increase with macro risk. Since investors may not know the length of any recession, it make sense that they will want greater compensation for holding a longer-term bond. 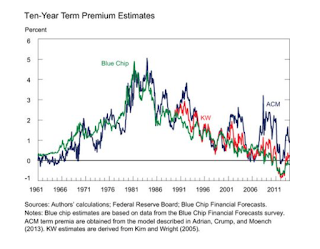 Similarly, if there is greater uncertainty about interest rate forecasts there will be a higher premium. The long-rate is the average of short rates, so less uncertainty on future short rates will translate into less risky bonds. 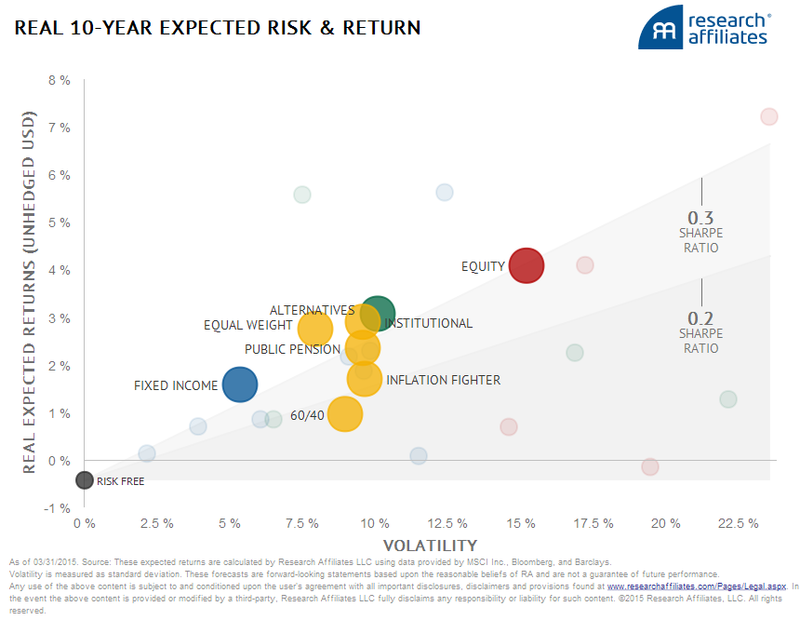 Risk premiums will also be rated to the volatility or uncertainty in bonds. 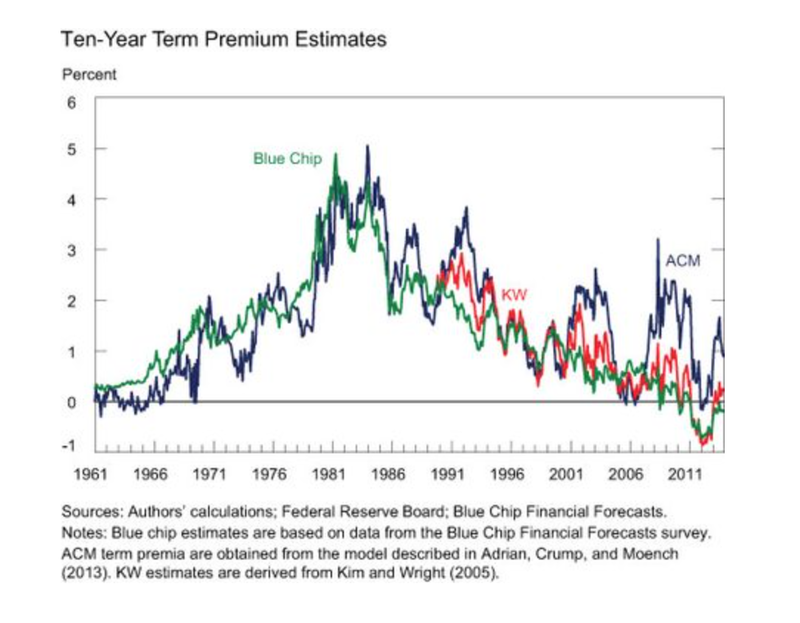 If there is lower risk with holding bonds, the term premium will also decline. 1. Is there a chance of an economic downturn increasing or decreasing? 2. Is there a chance of more futures short rate uncertainty? 3. Is there a greater likelihood of more bond volatility? I would say that the answer to those three questions is yes. Hence, the likelihood of term premiums increasing will be higher. We are seeing that effect in Europe with the reversal in bonds and we expect that it will also happen to a greater extent in the US. 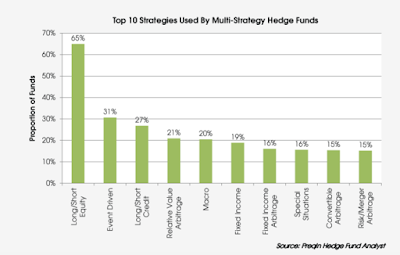 Multi-strategy hedge funds - are they limiting? 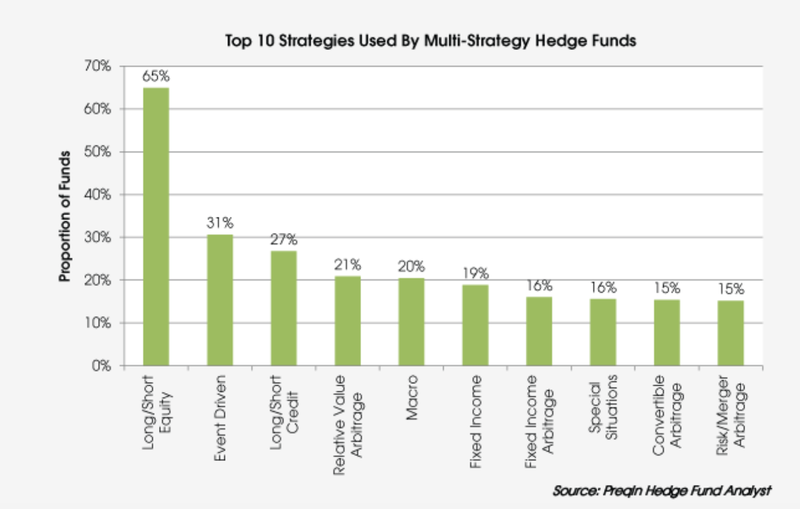 The multi-strat hedge strategy have seen a surge in new funds over the last year and has been the focus of investors who want hedge fund diversification. A multi-strategy hedge fund has a broad mandate to find the best opportunities across all hedge fund strategies. Prequin, the alternative investment data collector, through market survey work, has looked closely at the portfolios of multi-strategy hedge funds. Their work presents the most popular strategies used by these managers. 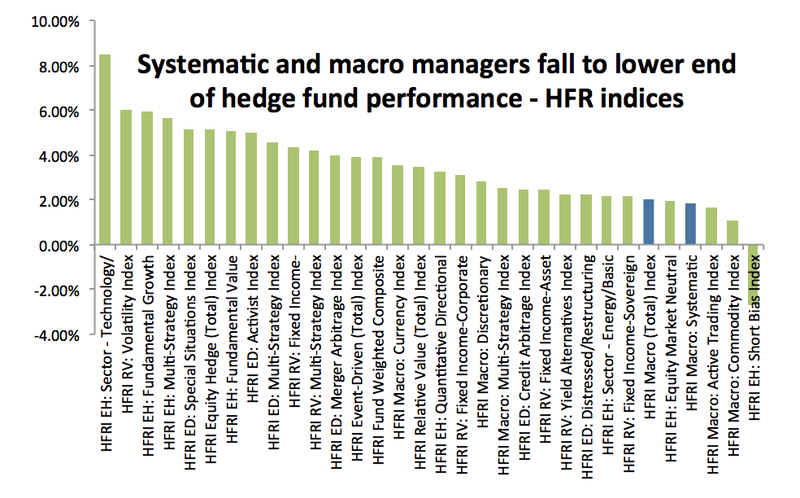 The majority focus of these funds seems to be directed to the most popular hedge fund strategies. The Prequin survey shows that 2/3 of multi-strategy managers will use long/short equity. This will outstrip the next two strategies, event driven and long/short credit by a factor greater than 2. The multi-strat manager will have a strong focus on equity market alpha and beta relative to other factors, albeit the beta may be much lower than the market. I find this odd survey result odd. It would seem that a true diversified multiple strategy manager should have some combination of all different strategies. Given the diverse collection of strategies and correlations, it would seem that the low number for some strategies would mean that multi-strat managers are under-diversified. There will be more diversification with a multi-strat hedge fund than what would be received from a single manager, but not having exposure to all strategies seems to limit the usefulness of a broad mandate. Nouriel Roubini, Dr Doom, nicely described the current market paradox of macro liquidity and market illiquidity as the big problem facing investors. His negativity may prove to be correct. This is a very important and subtle problem facing investors which is a collision between Minsky speculative behavior and a cascade problems. The Minksy description of bank lending behavior has been used to effectively explain the financial crisis. In very simple terms, a low risk stable rate environment breeds speculative behavior and risk-taking through leverage. The excessive speculative behavior of lenders creates the seeds for an unstable market environment. A cascade or herding problem exists when expectations or behavior is one-sided. 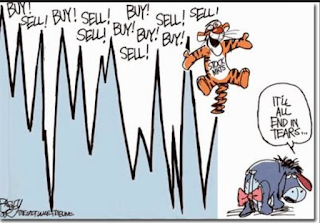 Similar behavior or reaction to information will lead to a market cascade and extreme market moves. Additionally, while the Fed has added market liquidity, regulation has then away trading liquidity by reducing the speculative behavior of bank dealers. Excessive liquidity, one sided bets and views, and limited market-making capital provide an excellent environment for sharp market declines. Where is performance headed for the rest of this year in managed futures? If we just annualized the returns for the SocGen trend-following index, we would get a return of just under 7 percent and a volatility that will be less than the average over the last ten years. 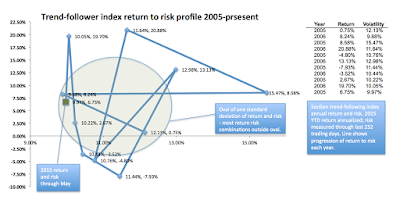 What is interesting is that the managed futures pattern of return and risk are not very clear over the last decade. We tracked the return and risk each year and place them on the two dimensional plane with a line traveling through the combination from year to year. You can see that performance can rise and fall without much regard for the volatility during the year. 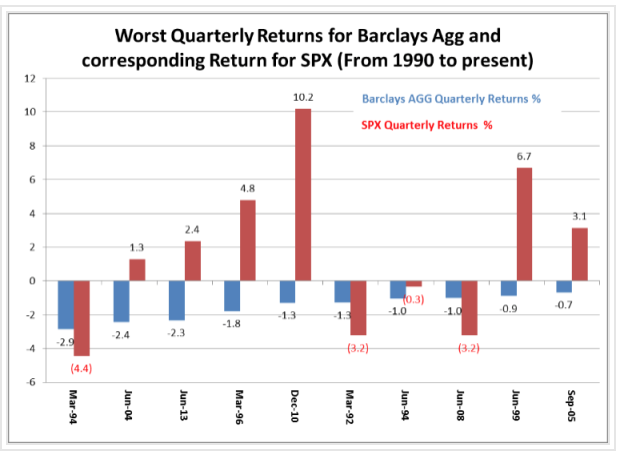 In fact, you can see that the years of poor performance were associated with average or low volatility. 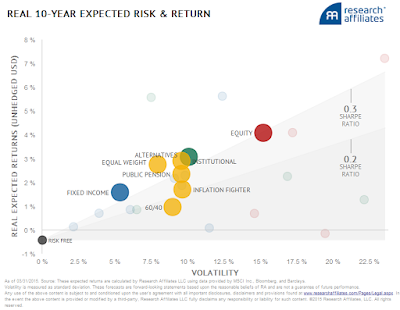 but the graph also shows that high returns we're associated with average or low volatility. To show what is average, we highlighted and oval which takes the average return over the last ten years plus and minus the standard deviation on the vertical, and the average volatility plus and minus its standard deviation on the horizontal. What is noticeable is that there is nothing that seems to be average. Only three of the years are inside the oval. Of course, if we widened the oval to two standard deviations, there would be only one outside of the oval based on higher volatility. What this simple graph tells us is that it is hard to say what is normal for managed futures on a unconditional basis. That said, we can place some bounds on possible performance. Our guess is that a sell-off in stocks or bonds will lead to a higher return profile, but there is no such things as an average year. The term premium for bonds is the excess return for holding a long bond over a series of short rates. Long-term rates should be equal to the combination of future short rates, but the relationship is not perfect. There is a term premium with bonds which is the difference between actual yields and the average of the short rates of yields. The term premium could be the risk from holding long-term securities or related to the change in the demand for long-term securities. Hence, the number could be positive or negative for which the answer is an empirical question that may change through time. From a macroeconomic perspective, the term premium is the portion that cannot be explained by real and expected inflation, or the combination of risk premiums on real rates and expected inflation. It sounds so easy to find this value; however, it actually takes some work. It can be calculated through splicing together forwards, forming an econometric model of macro factors, or through a comparison with survey forecasts and actual bond yields. 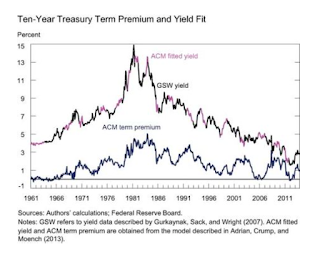 Analysts have been spending more time calculating this term premium number because it is critically important to help find the equilibrium interest rate. If we know what is the risk premium and the equilibrium rate, we will have a better idea of whether current rates are loose or tight relative to some valuation. Of course, finding each of these is subject to error and not directly observable. 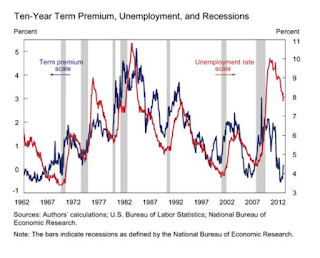 The term premium seems to be counter-cyclical and thus rising when output is low. 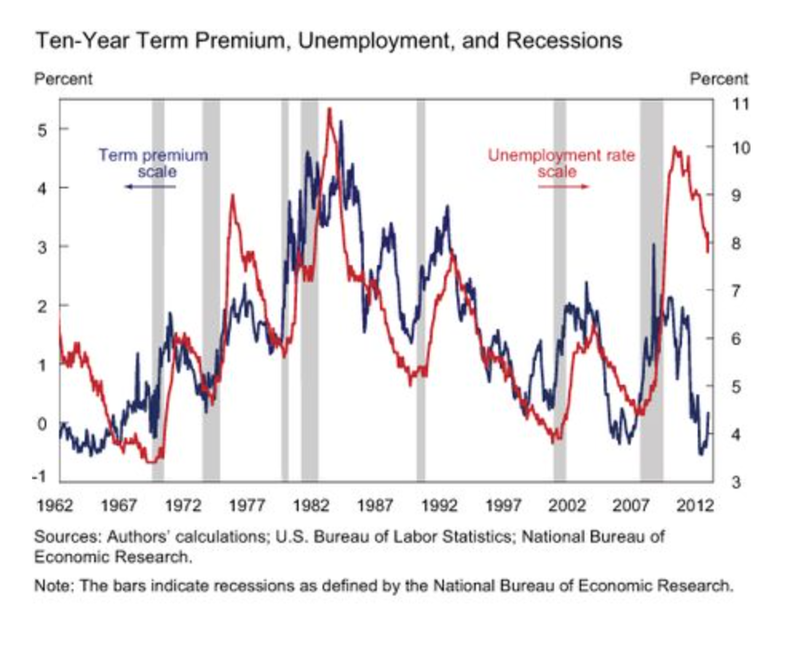 Still what is worrying to many is the long-term downtrend in the term premium. It has turned negative until recently which, while not unprecedented, has not occurred for decades. If there is a bond bubble, I would focus on the fact that there is no term premium for holding long-term bonds over the average of short rates as dangerous sign. 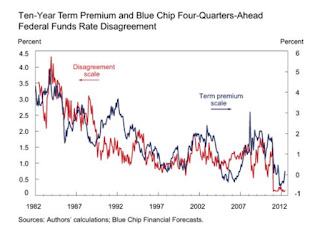 The term premium can jump without much change in the underlying real rate or expected inflation. This will create a risk that will force investors out of bonds. If perception of bonds risks change, we can see a sell-off which may not be directly related to higher inflation or economic growth.